If you’re searching for a sewing machine to do quilting, you know that not just any machine can handle the demands of quilt-making. You’ll need a machine with plenty of throat space and an extended work table. Features like a knee lifter or automatic thread-cutter are also quite handy. The biggest names in sewing machines produce sewing machines to specifically meet the needs of hobbyist and professional quilters alike. Some can be used on their own or in a quilting frame. Others are designed for broader use, with a variety of decorative stitches and other features that make them useful for sewing both clothes and quilts. A few are computerized while others skip the digital display screen for basic but efficient operation. Choosing the right sewing machine for quilting becomes simpler when you consider the types of quilts you want to make. You'll also want to think about the space you have available and whether you want extra features or the ability to easily transport your machine. We've picked the best sewing machines for quilting so you can make your sewing dreams a reality! If you’re looking for a feature-rich sewing machine that is capable of quilting and more, then the Singer Modern Quilter 8500Q is your best overall choice. With 210 programmable stitches and the ability to work at speeds up to 1600 stitches per minute, this computerized machine is a workhorse with a mid-range price tag. What really sets this one apart is the knee lifter, which is very helpful to quilters and can be hard to find in this price range. People find this machine to be equally useful for free-motion quilting and other sewing projects. A nice touch is the included circular stitching patterns. This machine is also well-suited to quilting thanks to the oversized 22-inch deck and quilting stitches like the stay stitch and finishing tie-off stitch that pulls the thread to the back. Even after several months of use, quilting and sewing enthusiasts keep finding new reasons to love this machine. The Singer Modern Quilter 8500Q is the best overall choice for a sewing machine adapted for the needs of quilters. If you’re looking for a budget sewing machine that can be used to quilt, you may have to skip a few features. However, you won’t miss out on a quality quilting experience with the Brother XR3774. This sewing machine won’t break the bank and is the best available, thanks to its easy operation and extended table for quilting. Other attractive features include 37 programmed stitches and 8 sewing feet, including walking and quilting feet. While it doesn’t have retractable feeder dogs like some other quilting machines, it does include a darning plate to cover them. Most people find it to be a suitable solution. A lot of hobby quilters have found great success using this machine. They appreciate the see-through top bobbin loader, the lightweight design, and the quilting table. For a value-packed quilting machine, the Brother XR3774 is a solid choice. If you’re looking for a versatile machine that can handle sewing clothes and produce beautiful quilts, the Project Runway Limited Edition Sewing Machine by Brother is a popular choice. This well-loved sewing machine easily transitions between creating couture dresses and quality quilts. It has 100 stitches, with some designed for function, decoration, or to give an heirloom look to your project. When working on clothes, you’ll appreciate the free arm for sewing pant cuffs or sleeves. Also, the eight styles of one-step buttonholes will make life a lot easier when repairs are needed. For quilting, an oversized table will assist in managing the fabric. If you plan to free motion quilt, a 45- by 60-inch quilt has been found to be an ideal size for this machine. Some people have had success quilting blankets up to 55 by 72 inches, though. The smart features included with the Brother Project Runway sewing machine will help you create clothes and quilts with ease. While it may not have all the bells and whistles that one designed exclusively for quilting would have, it allows you to get the job done and enjoy the machine to create a variety of things. For a sewing machine that can embroider with ease and also do some quilting, the Brother SE400 is a top choice. Featuring 70 built-in embroidery designs and a 4-inch by 4-inch embroidery frame (larger frames can be purchased separately), you’ll be able to add beautiful designs to just about any sewing project. To download more embroidery designs, the machine can be connected to your computer using a USB cord. One thing to note is that some people found the included USB cord to be on the short side. If you have a laptop this won’t be an issue, but you may have to purchase a longer cord if you have a desktop computer that isn’t near your sewing machine. When it comes to sewing and quilting, the machine offers 67 stitch options and a push-to-sew button that allows for pedal-free operation. Quilters will appreciate the ability to set the needle to stop in the up or down position. This machine is best suited for smaller quilting projects as the throat space is relatively small compared to some other machines. Still, the embroidery function makes this a great machine for those who want to quilt and embroider items such as baby blankets. For a sewing machine that can quilt just about anything you put in front of it, the Juki TL-2000Qi is a superb choice. It also comes in well under the $1,000 price range. Juki is well-known for producing sewing machines that are durable and much-loved by both hobbyists and professionals. The TL-2000Qi offers lightning-fast sewing speeds of up to 1500 stitches per minute and is a quilter’s dream with a free motion foot and a quilting foot. The throat measures nearly 9 inches and allows for easy sewing of even king-size quilts. It only features one straight stitch and skips the decorative stitches found on many hobby sewing machines. Avid users of this machine promise that you won’t miss the extra stitches, thanks to the outstanding performance of the TL-2000Qi. You will need to oil this machine, but Juki has made the process quick and easy. Additionally, it can be used on its own or in conjunction with a quilting frame. People love the machine for its quiet, smooth operation and describe it as being able to quilt through many layers of fabric with ease—like a hot knife through butter. If you’re a serious quilter moving up from an entry-level sewing machine or if you’re looking for a machine that will last for many years to come, the Juki TL-2000Qi is a great choice. The Singer Quantum Stylist 9980 is a popular choice for a quilting machine that's under $500. This computerized sewing machine offers more than 800 built-in stitches. It also has an assortment of presser feet, including a walking foot that many people have found to be perfect for free motion quilting. Used in conjunction with some of the decorative stitches, it’s easy to create a beautiful quilt. The built-in LCD screen will also offer up helpful guidance on which foot to use with a selected stitch, taking some of the guesswork out of sewing. Other features that are appreciated by people who use it for quilting are the automatic thread-cutter, the throat space, and the size of the work table. The Singer Quantum Stylist 9980 is often recommended for intermediate quilting, but it’s capable of meeting the needs of quilters of all experience levels. If you’re in the market for a portable sewing machine, the Brother CS6000i is easy to tote around without sacrificing essential functions and features. This well-loved, compact sewing machine can tackle a variety of projects and has 60 built-in stitches. People find it to be super lightweight—some even say they can lift it with a finger! When you’re ready to take it on the go, simply place it in the molded, two-piece case for protection and carrying convenience. This makes the machine perfect for taking to quilting classes or groups. 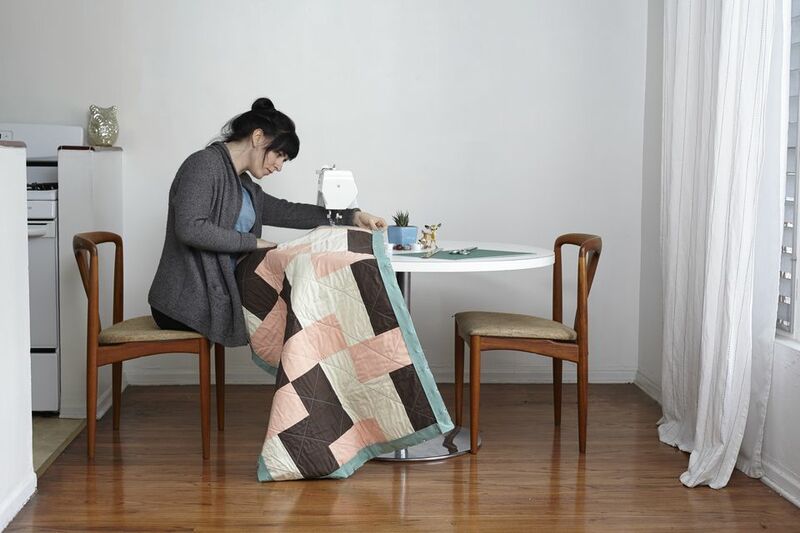 When it comes to quilting projects, the walking foot and quilting guide make it easy to turn out evenly-spaced stitches and beautiful blankets. Many people love this machine for quilting and have produced everything from small-scale baby blankets to full-size quilts. The Brother CS6000i works great and travels easily, so it's a great choice for the quilter on the go. At The Spruce Crafts, our expert writers are committed to researching and writing thoughtful and editorially independent reviews of the best products for your life and your hobbies. If you like what we do, you can support us through our chosen links, which earn us a commission. Learn more about our review process.